I am so thrilled to be joinging the Cookie Exchange hosted by the lovely Vanessa @ Southern In My Heart., and Gourmet Meals For Less. 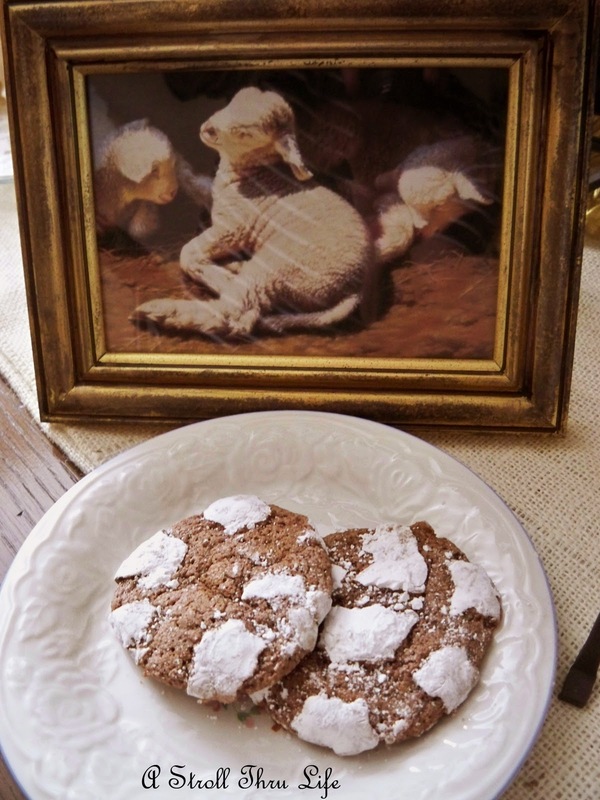 Be sure to visit them to find wonderful cookie recipes for the season. This is my family's favorite cookie. It is a Chocolate Crackle. Tastes like a brownie and so yummy. Melt chocolate, add oil, sugar and beat until well mixed. Add eggs one at a time beating well after each. Add vanilla and mix. Add the sifted flour, baking power and salt gradually and mix thoroughly. Add nuts if desired. Cover with saran and place in refrigerator to chill for a couple of hours or overnight. 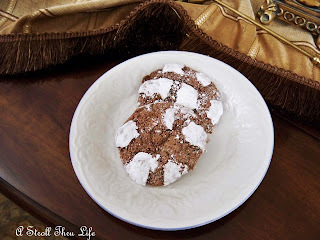 Use a rounded teaspoon full of dough and shape into a ball, then roll in powdered sugar. Place on greased cookie sheets and bake at 350 F. for 10 to 12 minutes. Cookies will look slightly wet and puffy when done. Remove as soon as possible to wax paper to cool. Makes about 4 dozen. Merry Christmas, and thanks for stopping by. Those look great Marty! Salad oil was something I have never seen used. I joined Vanessa's too, I am not much of a baker, so perhaps this will inspire me. Happy Holidays! I love your photos of them displayed perfectly. I haven't made these in years, so thank you for reminding me how yummy these are. These look great, Marty. I'm needing a cookie recipe for Wednesday's cookie exchange at work, I'm going to have to keep this one in mind. I didn't get to participate in the cookie exchange but I love to bake. I have never met a cookie that I didn't love and these sound delicious! A cookie that tastes like a brownie? What's not to love! :-) Thank you so much for linking up to our Cookie Exchange Marty! This has been lots of fun. I feel so badly that I didn't get to join your cloche party! I have one decorated for Christmas but no pics of it yet. :-( Maybe I will just have to be late to the party! Anything that tastes like a brownie has to be delicious! Convince me no more! The cookies look awesome...but the picture of the lambs...so beautiful. I keep going back just to see it. These look so good, Marty! Thank you for the recipe. These look so good Marty! I love all of the different cookie recipes I am being introduced to. Thank you so much for coming over and linking up. Merry Christmas! Looks delicious! I'm going to have to add it to my baking list! Those look really good Marty! So sorry I missed the cloche party. I have been so busy with Grandbaby and my job that I just didn't get a post ready in time.